WALL, N.J., Feb 06, 2019 (SEND2PRESS NEWSWIRE) -- Smart Sips Coffee founder and president, Lara Nikola, went swimming with the sharks from Shark Tank as a guest on Good Morning America's newly-branded afternoon show called "Strahan and Sara," pitching her unique fun flavored coffees, lattes, cappuccinos and hot chocolates. In her pitch to Sharks Mark Cuban, Lori Greiner, Barbara Corcoran, Daymond John and Kevin O'Leary, Nikola touted that you can drink your dessert without the calories, carbs or sugars. 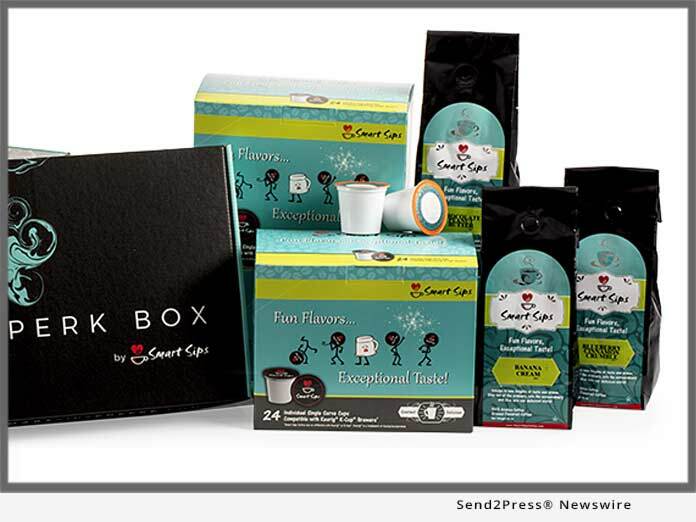 Smart Sips decadent flavored coffees are sugar-free, carb-free and two calories per cup. Kevin O'Leary, otherwise known as "Mr. Wonderful," sampled Smart Sips' chocolate peanut butter coffee during the segment, calling it "damn good." Nikola explained how Smart Sips Coffee is not your ordinary cup of joe, saying, "We put excitement into the daily coffee drinking routine with flavors like brown sugar bourbon, chocolate peanut butter, blueberry cinnamon crumble and so much more." Taking the bait, the Sharks congratulated Nikola on the success of her e-commerce business she started out of her house six years ago and has since grown into a multi-million-dollar company. Shark Daymond John called her success "amazing," adding, "We have to find a way to be partners!" The afternoon extension of ABC's Good Morning America first aired in September and was recently rebranded with a new name, set and logo. "Strahan and Sarah" is taped in the morning and airs at 1 p.m. ET. Smart Sips Coffees' uniquely flavored products are sold nationwide at https://www.smartsipscoffee.com/, Walmart.com and Amazon and are available in single serve cups compatible with all Keurig K-cup machines as well as in ground bagged options.